They’re describing “The Pearl Fishers,” with costumes and sets inventively and flamboyantly designed by internationally famous fashion designer Zandra Rhodes. The production comes to the Lyric Opera of Kansas City April 27 through May 5. “In selecting our 2018-2019 season, I could not pass up the opportunity to showcase the brilliant and truly original sets and costumes,” said Lyric general director and CEO, Deborah Sandler. “Les Pecheurs de Perles,” by Bizet, written before his better-known “Carmen,” is a tale of a love triangle in the mid-1800s between a priestess, a chieftain and a lowly pearl diver. Passion, betrayal and revenge are played out on the exotic island of Ceylon (current-day Sri Lanka.) It’s a perfect setting for Rhodes’ brilliant colors and sensual flowing fabrics. In preparation, Rhodes traveled to the island with fellow artist Andrew Logan and immersed herself in its vibrant South Asian culture, colors and patterns. She produced a volume of sketches for sets and costumes and then translated those ideas into tropical, exuberant motifs for the stage. Rhodes gained fame as part of the new wave of British fashion designers in the 1970s. Her designs were considered unconventional and audacious, and adorned celebrities as diverse as Princess Diana, Jackie Onassis and Freddie Mercury of Queen. Natalie Wood modeled her first fashion line in the U.S. In 1995 Rhodes opened an interior design studio in California. Along with a penthouse in London, she shares a San Diego beachfront home with her 30-year partner, Salah Hassanein, former president of Warner Brothers. It was there that the San Diego Opera commissioned her to design costumes for “The Magic Flute” in 2001, followed by “The Pearl Fishers” in 2004 and “Aida” in 2007. It takes “about three years for the process to get from initial sketches, to concert, to the stage,” Rhodes notes on her website, zandrarhodes.com. And that’s amidst a dizzying schedule of other career activities. Rhodes is the founder of the Fashion and Textile Museum in London. She has been appointed Commander of the Order of the British Empire and is an official “Dame.” She’s met the queen five times. 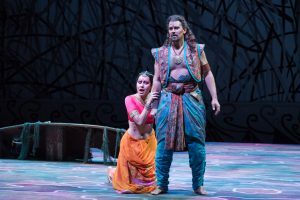 The Lyric Opera of Kansas City presents “The Pearl Fishers” April 27 through May 5 at the Kauffman Center for the Performing Arts. For more information and tickets, kcopera.org.